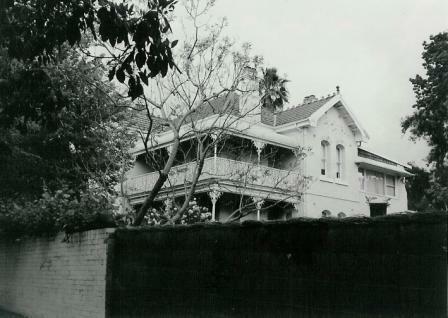 ‘Brantwood’ 77-79 Redmyre Road Strathfield is a large two storey home built in 1893. The house is early Federation Filigree in style. ‘Brantwood’ Redmyre Road and ‘Woodbine’ in Oxford Road were built on land owned by Mrs Elizabeth Swift (1861-1911). Mrs Swift (nee Pearson) was the widow of Samuel Hardy (1816-1865), a jeweller. Samuel Hardy with his brother John established the firm Hardy Bros Jewellers., watchmakers and silversmiths. Hardy Bros jewellers is one of Australia’s oldest jewellers and operates in Sydney and other major cities in Australia. John Hardy arrived in Sydney in July 1853 and established the jewellery business in Sydney. Prior to leaving England, he had entered into a partnership with his brother Samuel Hardy, a retail jeweller at St. Ives, Huntingdonshire, England. Samuel Hardy continued in the jewellery retail business in England and at the same time bought goods for the partnership in Australia. The partnership continued until Samuel Hardy’s death in 1865. John Hardy sent regular letters to his brother giving detailed information concerning the business in Sydney as well as information of a more personal nature. Many of these records including the business records of Hardy Brothers have been donated to the State Library of NSW. After Hardy’s death, Elizabeth Hardy married James Russell Swift, a barrister. At some stage she migrated to Australia and settled in Strathfield, possibly to be close to other members of the Hardy family. Mrs Swift’s brother-in-law John Hardy was a resident of Strathfield until his death in 1909. Hardy resided at ‘Strathfield House’ – at the time the suburb and Council were named after his house. Council records note the first owner of ‘Brantwood’ was a Miss Hardy (with no first name noted). It is likely this was Louise Lavonia Hardy, daughter of Mrs Swift and Samuel Hardy. Miss Hardy died in 1905 and records note that after this time, ownership of the property transferred to Mrs Elizabeth Swift. During the ownership of Miss Hardy and then Mrs Swift, the house was consistently tenanted. From 1897 to 1900, the house was leased by Walter Sewell Buzacott, principal of Buzacott & Co, engineering and ships chandlers. From c.1902-c.1908, Neil Cameron JP leased the house. Cameron (d.1910) was the manager of the Farmers and Dairymen’s Milk Company, Ltd., Ultimo. His wife, Helen (d.1915) was the daughter of Alexander Meston, an early farming settler of the ClarenceValley. Her first husband established the township of Maclean in NSW. Mrs Swift died in 1911 leaving a vast estate with her assets in NSW and Victoria valued at over £40,000. HOMEBUSH.-Two-story Residence, BRANTWOOD, OXFORD-STREET, near Council-chambers, a quiet select situation. It is well-built of brick, painted, tile roof, tiled verandah, balcony, hall, 6 rooms, linen press, pantry, bathroom, maid’s room, kitchen, scullery, etc., etc, stabling of wood. District enjoys light, dry, crisp atmosphere, and full train services. Torrens Title. LAND. 100ft OXFORD STREET. 100ft REDMYRE ROAD, with through depth of 244ft. Messrs. HOLDSWORTH and SON are Solicitors to the Estate. AUCTION SALE, FRIDAY, JANUARY 1, AT OUR ROOMS, 88 Pitt-street, at 11.30. In 1912, the house was sold to Christian Stockman, produce merchant. By 1924, ownership had transferred to Gertrude Becker. In September 1938, Gertrude Becker sold ‘Brantwood’ to Harrie Mitchell, barrister at law for £2000. Mitchell was the owner of the house from 1938 to 1962. During Mitchell’s ownership, the house was divided into two flats. Harrie Mitchell (1906 – 1967) was Member of NSW Legislative Assembly for the electorate fo Burwood from 1938-1941. Mitchell was born in Warren NSW, the son of R D J Mitchell. He was educated at BathurstHigh School and University of Sydney receiving his bachelor degree (BA) in 1929. He was admitted to the the Bar in May 1936 and transferred to roll of solicitors in 1944. He served in the RAAAIF during World War II and was made a Major. Mitchell had multiple business interests including chairman of Dresslers Brewery (Australia) Pty Limited, director of Farren Price Australia Limited, Time Corporation Australia Pty Limited, Home Building Co-operative Society Limited and Services Mutual Insurance Society Limited. From 1951 to 1967, he was the federal president of Australian Legion of ex-servicemen and women, a member of Australian Council of World Veterans Federation, chairman of Policy Commission of World Veterans Federation, vice president of Lampada Della Fraternita, member of Commonwealth Advisory Council on Migration, member of central District Ambulance Board and cavaliere of Order of Merit of the Italian Republic in 1957. In June 1962, Harrie Mitchell sold the house for £10,250. In April 1969, the vacant lot at 77 Redmyre Road, which had been part of the ‘Woodbine’ Oxford Road property, was purchased by the owners of ‘Brantwood’. ‘Personal (death Neil Cameron)’, Sydney Morning Herald, 20 Oct 1910, p8. “Will of late Mrs Swift”, Sydney Morning Herald, 14 Dec 1911, p10. Strathfield Council building records, meeting minutes, valuation lists and notices of transfer. “Walter Buzacott”, Men of Mark Vol. II, 1888 pages 296-298. (c) Cathy Jones 2011. Do not reproduce, copy or publish this article without first seeking permission from the author.